December can bring a month of rough weather with rain, snow, cold or all three. Some deer hunters ride it out in a comfortably enclosed blind, perhaps with a stove to keep them and their coffee warm. But others try to turn it to their advantage by still-hunting through the woods. Damp weather also dampens the sounds a hunter makes, tipping the scales a bit in his favor as he tries to sneak up on a wary buck. I am one of those still-hunters, and whether I am following tracks in the snow or just sneaking through good cover, I know any shot will likely come quickly. I always consider shot placement, trust my instincts and shooting ability. I also fire follow-up shots as fast as I can keep them on target—until I see that deer fall. One of my favorite guns for this is a Marlin 1894 lever-action carbine, an older Guide Gun in .44 Magnum recently topped with a Leupold 1-6X scope. Bolt rifles may shoot magnum cartridges that are ballistically astounding, but they aren’t for this kind of hunting. No, the lever action has always been king of the Maine woods, with its traditional .30-30 cartridge likely taking more deer than all others combined—140 years young, and still going strong. Some years ago, I did a carefully timed test to see how quickly I could put five shots into a paper plate at 30 yards, with different rifle actions. Shooting equivalent-recoil loads, the bolt-action rifle required 2 to 2-1/2 seconds a shot while the lever action required a shade over 1-1/2. Whether you need a quick second shot at a deer disappearing in the brush or a bear charging at 20 yards, the quickness of the lever action can come in handy. The back-and-forth motion of the lever is not only quicker but much less distracting than the four-step process of up, back, forward and down required with a bolt action. Think that might have something to do with why so many Alaskan guides carry Marlin levers in grizzly country? The lever rifle has also kept up with the times, lending its inherent handling advantages to some of today’s most potent new cartridges. Hornady breathed a new level of life into the traditional tubular-magazine rifle with their LEVERevolution ammo. Not only did the elastomer-tip bullets prove safe in tubular magazines, their aerodynamic shape boosted downrange performance clear off the charts. Who thought that one day a tube-fed .45-70 would be delivering more than 1,000 foot-pounds of energy at 300 yards? The previously necessary flat-nose bullets lose as much as 40 percent of their energy by the time they pass 100 yards, and it goes downhill from there. Standard .30-30 ammo with a 150- or 170-grain flat-nosed bullet delivers a puny 540 foot-pounds of impact at 300 yards. But the pointed bullet (and better powders) give a LEVERevolution 160-grain FTX .30-30 load 1,025 foot-pounds of deer-for-sure power at 300 yards, and the same technology in .32 Special gives 1,000 foot-pounds with just 14 inches of drop at 300 yards. That’s lethal impact for a deer, and a perfectly makeable shot with a side-mounted scope on an old Model 94. The rubbery tip is not only safe and aerodynamic, the base also helps initiate controlled bullet expansion upon impact. 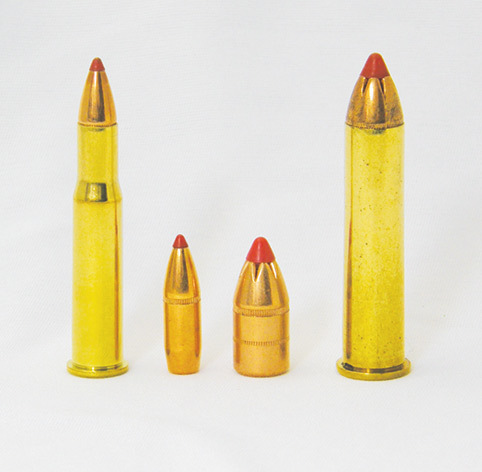 The .357 Magnum, .44 Magnum and .45 Long Colt have all gotten similar lifts with the LEVERevolution treatment. And Marlin and Hornady didn’t stop there, as they jointly developed two truly long-range elk-worthy lever cartridges, the .308 Marlin Express and .338 Marlin Express. The .308 Express offers two loads. One drives a 160-grain FTX jacketed bullet at 2,660 ft/s, delivering 1,200 foot-pounds at 400 yards. The other drives a 140-grain Hornady MonoFlex bullet at 2,800 feet a second. And 140 grains isn’t too light for elk, not when you consider the terminal performance of that high-tech bullet. The standard 150-grain .30 bullet hunters have been shooting for decades typically loses 20 percent of its weight, or about 30 grains of lead, as the nose peels away during mushrooming. This leaves only 120 grains for penetration. But the monolithic 140-grain bullet forms a perfect mushroom with no loss of weight, which means it then penetrates with considerably more weight than what the traditional 150-grain bullet actually delivers. Being a bit lighter, the 140 can be given a slightly higher muzzle velocity, too. Talk about win-win. The Marlin .308 Express is ideal for deer and perfectly adequate for elk. The .338 Marlin Express is ideal for elk. When the bolt-action rifles of World War I came along, with great cartridges like the .30-06, big-game hunters everywhere became enamored with the boost in down-range energy and flatter trajectory. The bolt action was also favored for its strength, aptly so when compared to the Winchester Model 94 lever action. A stronger action meant more potent cartridges could be fired safely. The bolt’s powerful camming action also better extracted a cartridge that became stuck in the chamber. Yet conservative woodsmen remained loyal to lever actions in proven cartridges like .30-30, .35 Remington and .32 Special. Some may think the .30-30 a bit inadequate for big game, yet that’s far from the truth. More than a century of success tells us the .30-30 has something going for it, and that something is perfect balance between the bullet and mild yet very adequate velocity, such that the load is a pleasure to shoot, and the bullet performs perfectly on a wide variety of game. Hot-stepping magnums can kick like the proverbial mule, and those fast-flying bullets must be soft-nosed enough to form a mushroom in the lungs of a whitetail at 400 yards yet tough enough to withstand smashing into a bear’s shoulder at 20 yards. That’s a lot to ask, and sometimes we see not-quite-perfect results. The .30-30 does not have to handle such extreme forces, even at close range, assuring a proper mushroom with adequate penetration. In a lightweight, handy lever rifle, you have a package that will likely be popular for another century, at least until ray-guns come along. Mossberg and Rossi both recently began offering their versions of the traditional .30-30 lever gun. The .35 Remington is a very adequate deer cartridge in its own right, perhaps even a shade better than the .30-30. But the case has a narrow shoulder, and sometimes older rifles misfire due to insufficient depth of firing pin strike, caused by shoulder issues. Some brands of ammo are more prone to misfire than others. A solution that works for a couple of friends is to handload with cases fired in their rifles and only partially (neck) resized. So long as the cartridges chamber readily, they always fire. If there is a truly ideal deer cartridge for the Eastern woods, it would be the .300 Savage, with potency just shy of the .308. It is one of Savage’s early chamberings, dating back to 1920. The more potent .308, .270 Winchester and .30-06 outsold it, and it somehow became perceived as marginally effective. Yet a Savage Model 99 lever gun chambered in .300 Savage may well be the best Eastern deer rig ever, and the .308 version is as good a 300-yard rifle as any made, then or now. As I understand it, the Savage Model 99 didn’t lend itself to automated manufacturing, and expensive handwork kept prices high, eventually too high, and perennially slow sales eventually convinced Savage to drop the 99 from its line. Thumb safety, smooth action, rotary magazine, respectable accuracy and a century of tradition left me wondering why gun fanciers let this one slip away, even at a higher price. Browning’s BLR also doesn’t use a tube magazine, so there never has been a need to load flat-nose bullets with this one, either. Plus, it has the same strength as a bolt action, safely handling .270, .30-06, 7mm Remington Magnum and even .300 Winchester Magnum. The BLR features a lightweight aluminum receiver, flush removable magazine, rack and pinion smoothness. The trigger travels with the lever to eliminate pinching. It can be had in stainless steel, with pistol- or straight-grip stock. There is a take-down model. There is a Scout sight model. While some prefer the magnum capability and performance features of the Browning, others still favor the slimmer lines, lighter weight, visible hammer and high-capacity tubular magazines of the traditional Marlins and Winchesters. The Marlin lever action throws empties to the side, unlike the Winchester which throws them up where a scope might be. Marlins seriously edge the Winchester lever guns in accuracy, too. Marlin makes more than two dozen varieties of lever rifle including carbines with 16-, 18- and 20-inch barrels and rifle lengths of 22, 24 and 26 inches. Nowadays, confidence in rifle accuracy and scope dependability have given hunters faith in their ability to hit game at what was once considered extremely long range, especially with the hotter, flatter-shooting magnums so strongly associated with bolt-action rifles. But for fast action from 30 yards out to 300, you’ll most likely find me carrying a lever rifle.